You are here: Home › Container Conversion › Why a pop-up shipping container bar could call time on their fixed location counterparts. Why a pop-up shipping container bar could call time on their fixed location counterparts. 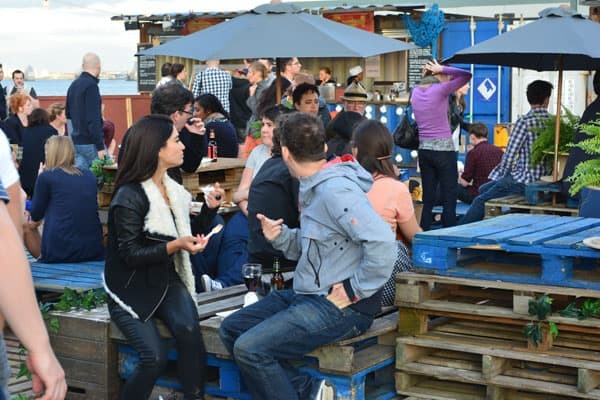 Learn how a pop-up container bar can help your business succeed. 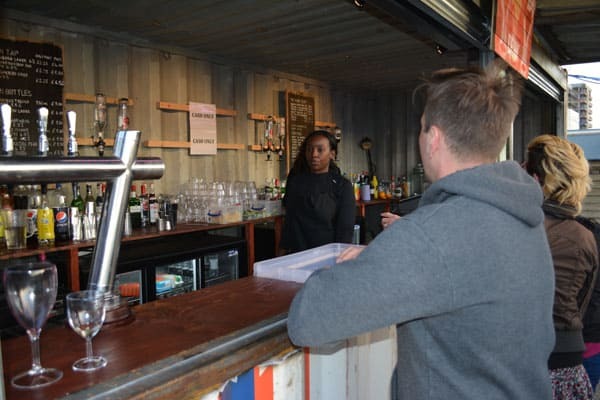 Could a pop-up shipping container bar be the ideal solution for your business? Some bar owners are already reaping the rewards of this alternative idea. Picture the scene; a converted shipping container as a bar, with wine, beer and cider being served to eagerly awaiting customers. Add to the blend a cocktail or two for all those mixologists out there, and it gets even more exciting. A pop-up bar might be just the thing for you to corner the market, and would provide more character than you can shake a stick at. Pop-up bar made from shipping containers in Greenwich, London. mutiple 20ft shipping containers were converted into a pop-up bar and street food outlet. Ability to move the container to another location in case you decide another site would be better for your business. Problems such as your landlord increasing rent costs, or a diminishing level of sales at your current site could be solved more easily. You can move the container bar to festivals and special events to make the most of a sales opportunity by simply moving your ready equipped pop-up bar to the event! A great example of this is the Kronenbourg container bar. The size of the container bar can be increased as your business grows, when you feel you’re ready, simply add another container. The container bar in Texas, Austin uses 7 containers to create their awesome space. Rather than having to rent a building, owning a pop-up container bar means you have a physical asset you can sell in the future. A shipping container bar means you won’t need to keep paying out for decorating and outfitting a venue, if you have to change location. You simply move the container bar to the new location you’ve chosen and the business is ready to serve customers just as soon as you are! Also, the heavy expense of moving into a static bar is another problem that could be removed by using a container. Rather than stumping up advance rent, deposits and guarantees you would just need an appropriate piece of land to rent, which is much more affordable. As your business gets larger you don’t have to worry, because a pop-up bar would grow with you, just add additional containers. The problems posed by fixed location bars are quite a sobering reminder (excuse the pun) of why container bars might be the future of the hospitality industry. In short, a pop-up container bar could save you a lot of money, disruption and stress – leaving you with more time to serve your customers and build your business. 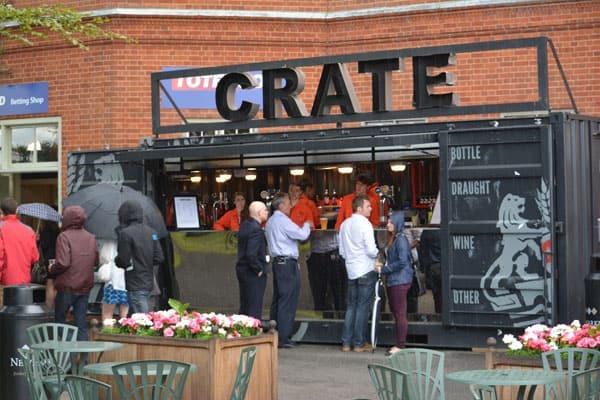 Editors note: Adaptainer converted the pop-up shipping container bar shown above and in the video but not the Crate Bar displayed in this post. We are able to offer a similar product.